St. Albert the Great was born Albertus Magnus, in Cologne, Germany. He earned an immense reputation as a scholar and a philosopher. He was educated in Padua. Early accounts refer to St. Albert’s encounter with the Blessed Virgin Mary, who convinced him to enter Holy Orders. He went on to become a member of the Dominican Order, against the wishes of his family. He studied theology at Bologna. He was selected to fill the lector position at Cologne, Germany, where the Dominicans had a House, and he taught there for several years. In 1245, he went to Paris to receive his doctorate and taught as a Master of Theology. 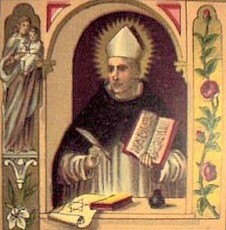 St. Thomas Aquinas began his studies under St. Albert the Great. He was the first to comment on virtually all of the writings of Aristotle, as well as on the teaching of Muslim academics. He was ahead of his time in his attitude towards science. Two aspects of his attitude deserve to be mentioned; he did not only study science from books, but actually observed and experimented with nature. Secondly, he took from Aristotle the view that scientific method had to be appropriated to the objects of the scientific discipline at hand. In 1254 St. Albert was made Provincial of the Dominican Order, and fulfilled the duties of the office with great care. During his tenure he publicly defended the Dominicans against attacks by the secular and regular faculty of the University of Paris. In 1260, Pope Alexander IV made him Bishop of Regensburg. As an act of humility, he refused to ride a horse, the transportation of his day, instead walking back and forth across his diocese. After his time as Bishop, he spent his time preaching. After suffering a collapse of health in 1278, he died on November 15, 1280 in Cologne, Germany. His relics are in a Roman sarcophagus in the crypt of the Dominican St. Andreas Chruch in Cologne. He was beatified in 1622, and canonized in 1931. He was proclaimed a Doctor of the Church by Pope Pius XI. His body is said to be incorrupt. St. Albert the Great was a German Dominican Friar and Bishop who achieved his fame for his comprehensive knowledge of, and advocacy, for the peaceful coexistence of science and religion. He was a very humble man, and one of the greatest philosophers and theologians of the middle ages. The Catholic Church honors him as a Doctor of the Church, one of only 35 persons with that honor.